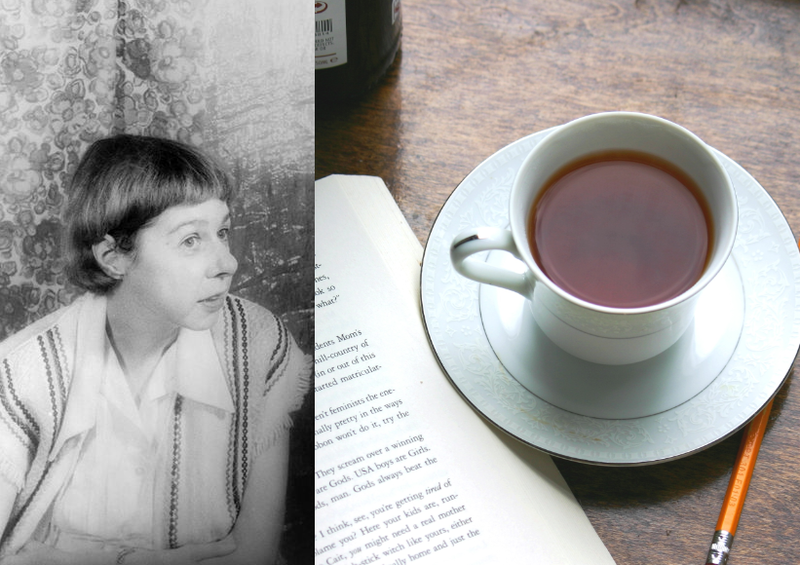 Who knows whether good roommates really make good writers, but McCullers’ friends knew what inspired her: that trusty thermos. At the artists’ community Yaddo, where McCullers was a resident, alcohol was rumored to be an integral part of her creative process; she “had to be a little high to work,” a colleague said. This dependence became more pronounced as time went on. Rather than rely on the thermos, she diversified, starting the day with a beer, continuing with the sherry/tea mixture, and rounding out the day with a bourbon or two. If you have a cheap bottle of dry sherry, mixing it with tea (try a citrusy brew like Bigelow Lemon Lift) is an easy way to cut the sweetness; adding a healthy squeeze of lemon is even better. Although McCullers drank “sonnie boy” both hot and cold, I prefer it as an alternative to a hot toddy: a warming way to end a rainy day—or, if you’re McCullers, to begin it. 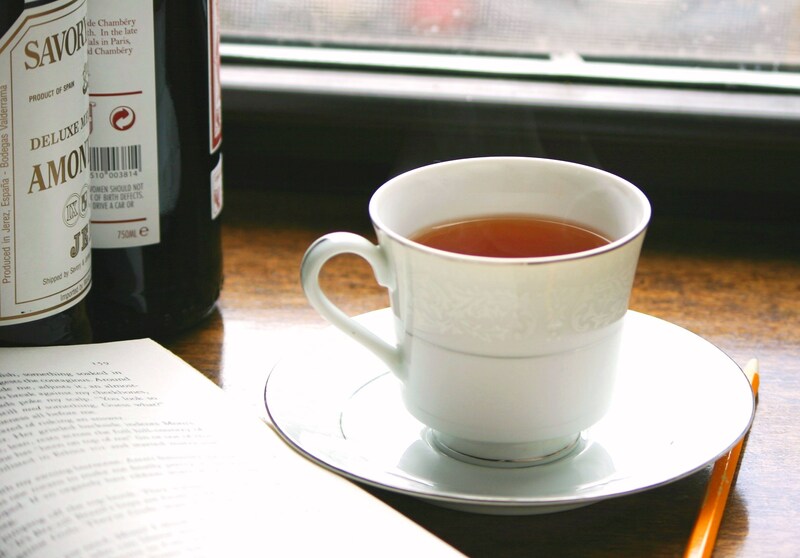 Brew tea to desired strength and add sherry. Stir and serve with lemon wedge, or pour into a thermos for a drink on the go. There is obviously so much more to writing than actually writing. Roommates can be an inspiration or another nightmare, as are friends. I live with a writer, I am a writer. We agreed long ago not to invade each others daily writing time. After breakfast we go our ways. Sometimes we can meet for lunch, most often we meet for cocktails at around six pm. Dinner is a shared meditation that returns us to material life. Writers who don’t cook tend to drink their meals away. We always have an open dinner door for our hungry writer friends. It’s better than hearing about how interesting the crowd is at McDonalds. So well put! I’m fascinated by writers’ routines, but haven’t thought too much about how those routines interact with each other. “Dinner is a shared meditation that returns us to material life.” I love that. How much richer our daily routines are for it. A French professor I had in college once told me to take a shot before a presentation – apparently it makes you more relaxed and more fluent. I don’t see why writing should be any different! Sherill Tippin’s February House, about 7 Middagh Street, is one of my favorite books. As a fellow Pisces, I can relate! I do too – it was one of the things I was reading as I was researching this post! I’ve lived with some big personalities before, but nothing quite like that. How inspiring–and frustrating–it could be! It’s always lovely to stop in, here. I love your writing style and always find the posts to be illuminating and mouthwatering. Thank you for coming by, Rhonda. It’s wonderful to share thoughts on food and writing with you! How well you write. There is certain warmth in the way you convey the most banal of things. Beautiful. That means so much, Anita – thank you for reading! I have felt the pain of the housemate fights over the kitchen. I love that its not just for us mere mortals but literary legends as well. That’s one of the things I enjoy most about writing these posts. It’s so easy to lose sight of all the dishwashing and handwringing that lies behind those great books! A bit late responding to this post… but I just found your blog! As an English major/lit fanatic and who enjoys cooking, this is wonderful to read! I’m a fan of Pynchon’s Crying of Lot 49, but haven’t yet read anything else of his. If there was mention of Mexican food in that book, I guess I didn’t catch it… so I’ll have to make note of it next time I read something of his! Hi, just wanted to tell you that after I read your post about McCullers, a writer I have always felt very close to, my first-ever trip to the US came roughly around the same time. Landed in Newark early in the morning and a friend drove me to his house in New Jersey. I had some tea and the next thing I made my friend do was to drive me to the Oak Hill cemetery where McCullers is buried. We couldn’t buy any flowers, but I plucked a tiny yellow bright flower from the wild and left it at her grave. I will always remember it. Thank you. This is so fantastic – thanks for sharing. Sharing the same space with writers and artists past is always such a reverent experience for me. I’m so glad you got to experience it while you were in the States. Pingback: Create Your Own Signature Cocktail | Craft Culture Co.